The Disney XD animated series Star Wars Rebels has gotten very little attention on this blog, aside from a post in late January about the show's growing relevancy to the Star Wars universe. Last night's Season 2 finale, "Twilight of the Apprentice," didn't just provide some truly exciting moments that would drop the jaw of any Star Wars fan; it also finally proved that Rebels can reach the same storytelling heights of its beloved predecessor, The Clone Wars. The hour-long episode involves Jedi Knight Kanan Jarrus, young trainee Ezra Bridger, and Clone Wars vet Ahsoka Tano traveling to the forbidden planet of Malachor to learn more about the Sith...and hopefully find a way to defeat them. Malachor first appeared in Star Wars: Knights of the Old Republic, and though the planet's original history doesn't match up completely with what Rebels shows us, both versions were the site of a major Jedi-Sith conflict. Its presence in Rebels suggests that other Expanded Universe elements could be brought into the new Star Wars canon, which is a very exciting prospect to anyone who was frustrated by the de-canonization of their favorite characters. The three heroes fall into Malachor's vast subterranean ruins, where they discover scorched corpses and a pyramidal Sith temple. 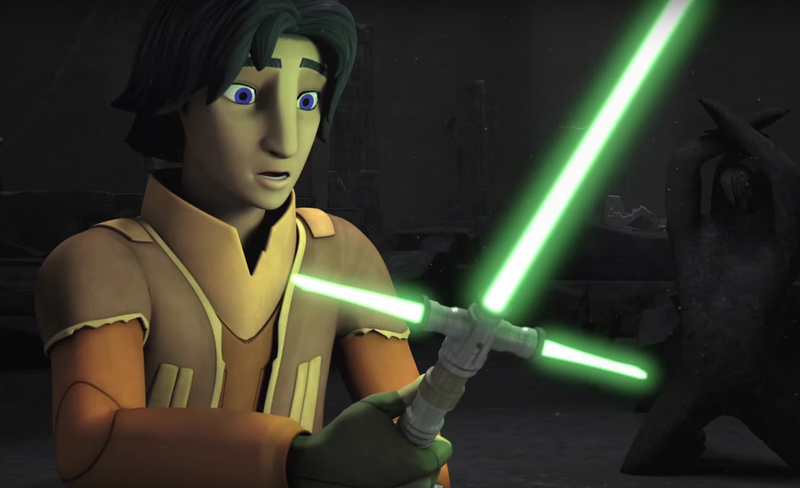 The episode's first eyebrow-raising moment comes when Ezra picks up a lightsaber off the ground and ignites its blade...along with two smaller crossguard blades. 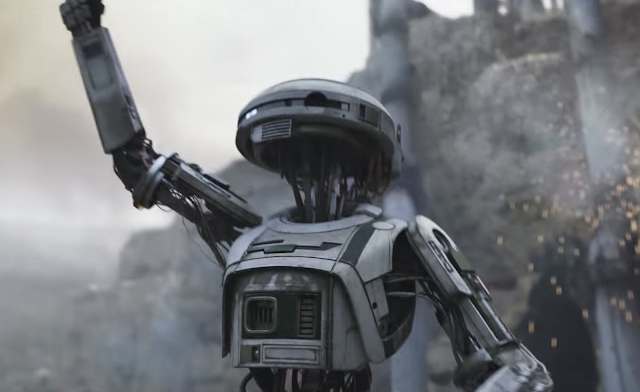 It promptly malfunctions and will probably be forgotten for the rest of the series, but you wouldn't expect Rebels to feature such a substantial connection to the origins of Kylo Ren's controversial weapon. The Force Awakens' visual dictionary even states that Kylo's design is an ancient one that dates back to the Great Scourge of Malachor. After being separated from his friends by a Jedi-hunting Inquisitor, Ezra quickly meets a hooded, seemingly-decrepit man with valuable information about the temple. It's Darth Maul, and it would have been a nicer surprise if the mid-season trailer hadn't spoiled Maul's return, but you can understand why Rebels' marketing team would want to broadcast that one of the greatest Star Wars villains would be coming back. Maul proves that he's trustworthy and encourages Ezra to harness the full potential of his powers as they work together to enter the temple and grab the holocron inside. They exit and find Ahsoka and Kanan facing three Inquisitors: the Seventh Sister, the Fifth Brother, and the newly-introduced Eighth Brother. Though the two never met in The Clone Wars, Ahsoka immediately recognizes Maul as a sinister threat, undoubtedly thanks to her friendship with Obi-Wan Kenobi. Maul lets his "actions speak louder than words" by shedding his cloak, igniting a double-bladed lightsaber (which he first introduced to the Star Wars universe, of course) and leaping into battle against the Inquisitors alongside Ahsoka and Kanan. The Inquisitors flee. Maul explains that he's an enemy of the Sith, too, and Darth Vader must be on his way to destroy them all. He claims that the secrets of the holocron will be unlocked if they place it in an obelisk at the top of the temple. Ezra vouches for him, and Ahsoka and Kanan reluctantly agree to work with him. They split up to make their way up the temple, killing the Inquisitors in the process and exhibiting a level of violence that Rebels has mostly shied away from. Disney might be getting some angry calls from parents about the implied decapitations and impalements, but it's certainly worth it if the show is abandoning its overly kid-friendly tone. Maul and Ahsoka duel and he reveals that Ezra is actually activating a "battle station" that will cause untold death. Kanan dons a mask of one of the Jedi Temple guards and uses Daredevil-like senses to hurl Maul off the cliff. Meanwhile, Ezra discovers the true nature of the temple as it emits crackling lightning and a purple beam straight into the sky. Darth Vader arrives with a typical, Vader-y dramatic entrance, standing on top of his signature TIE Advanced. Ahsoka comes to Ezra's rescue, and we finally have the moment we've been waiting for: Anakin and Ahsoka, master and apprentice, reunited. But Ahsoka is still doubtful that her good-hearted, honorable friend is the man behind Vader's mask. He tells her, "Anakin Skywalker was weak. I destroyed him." Vader's future grandson utters something very similar to this in The Force Awakens, making this another great example of how the Rebels writers can incorporate references to the Sequel Trilogy. 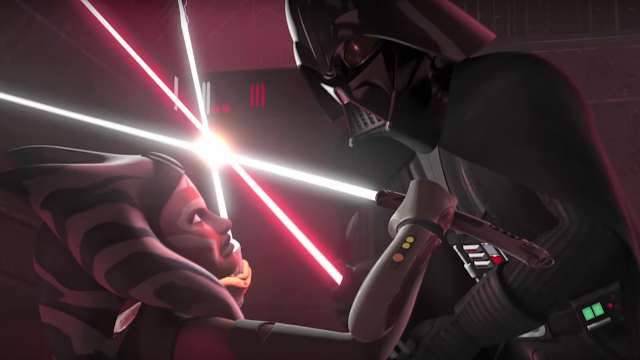 Ahsoka angrily suggests that she will avenge her master, and when Vader points out that revenge is against the Jedi way, Ahsoka replies with a truly awesome – if not predictable – line: "I am no Jedi." Ahsoka has some serious moves but it isn't long before the Sith Lord defeats her and Force-pushes her off the cliff. 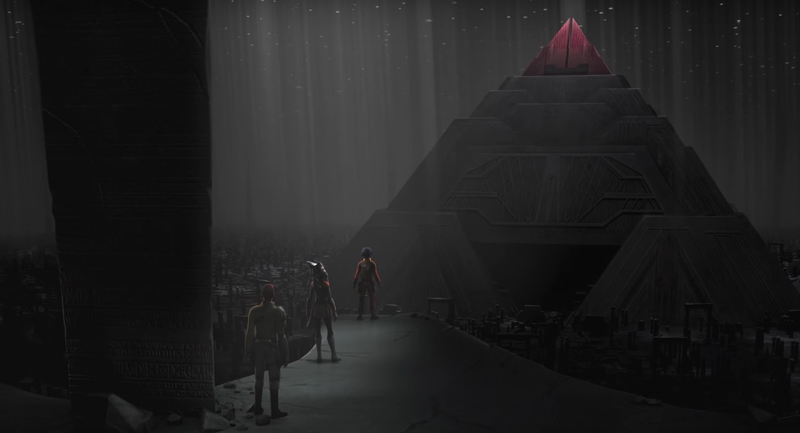 Ezra and Kanan together pull the the holocron out of the obelisk, causing the temple to begin collapsing. Vader prevents their escape and tries to claim the holocron for his own purposes, but Ahsoka returns and slashes part of Vader's helmet. She finally recognizes him as her old master. "I won't leave you, not this time," Ahsoka says, referencing the heartbreaking Clone Wars Season 5 finale, in which she left the Jedi Order and abandoned her master. Through his damaged helmet, Vader now speaks not with the familiar bass of legend James Earl Jones, but with the same voice as brave, passionate Clone Wars-era Anakin (Matt Lanter): "Then you will die." It emphasizes the tragic truth that the man who taught Ahsoka so much is now her intended murderer. Kanan and Ezra are forced to leave her as the temple explodes in a big ball of purple energy. The episode's final moments don't reduce the emotional impact. Kanan and Ezra return to their friends at the rebel base, and we see Captain Rex look crestfallen as he realizes that his old friend didn't make it. An unsurprisingly still-alive Maul leaves Malachor on one Inquisitor's TIEs, leaving the door wide open for yet another return. Vader limps out of the ruins of the temple, while an equally-wounded Ahsoka seems to be hobbling back inside, confirming that she's alive, even if she probably won't be returning to the series immediately. The core rebel team appears to mourn her presumed death, while Kanan sports a new blindfold and Ezra uses the Force to open the Sith holocron, suggesting that Maul succeeded in encouraging the darkness within him. "Twilight of the Apprentice" brought us multiple heavy moments, some semi-closure for the Anakin-Ahsoka relationship, and more than enough cliffhangers to get us excited for Season 3. But its biggest accomplishment is that for the first time in the series' history, Rebels has fulfilled what any Star Wars TV show should be: an expansion of the universe that features major connections to the films, but also gives us plenty of originality and new and lovable characters. Not to mention that it's been beautifully tying up loose ends left by The Clone Wars – or at least, letting those threads spin again. What did you think of "Twilight of the Apprentice"? What are you hoping for in Season 3? Tell me in the comments, and may the Force be with you all. 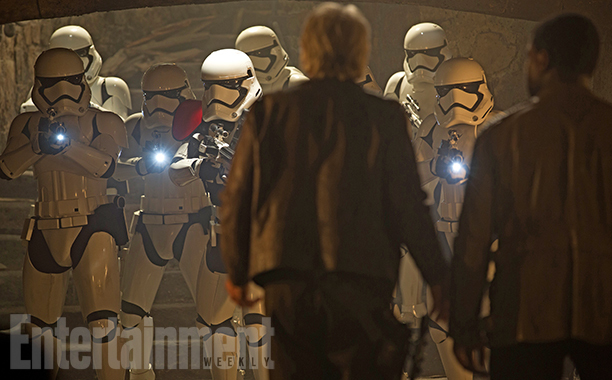 The Force Awakens will be available on DVD and Blu-ray in just a few weeks (April 5th, to be specific), and today, Entertainment Weekly provided an exclusive look at the seven deleted scenes that we'll finally be able to watch. 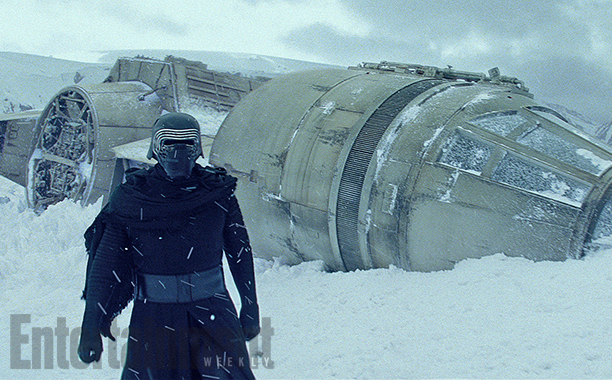 We already got a sneak peek of this scene in the in-home trailer, but this gives us another look at Kylo with the Millennium Falcon, presumably leaving it after searching its interior with a squad of snowtroopers. There's something tragic about seeing this lost soul stand next to the symbol of the family that he continually rejects. 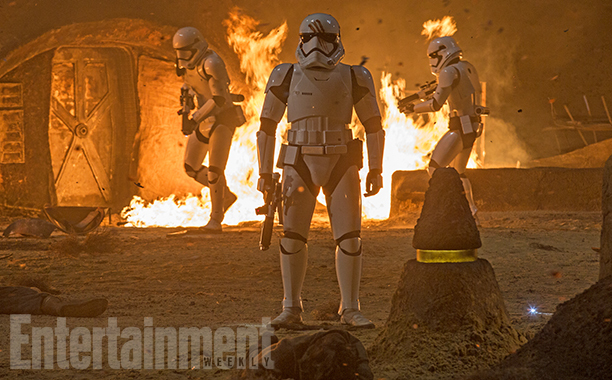 This is an extension of the Jakku village attack at the beginning of the film. In the original film, we saw Captain Phasma direct her troopers to execute the captured villagers, and we saw FN-2187's refusal to do so, but this scene shows him discovering a female villager hiding in the shadows of a building, raising his blaster, and ultimately deciding to let her go. (Though with all the other stormtroopers patrolling around, she'd probably end up dead anyway.) This would continue to characterize Finn as a gentle, merciful man before we even see his face. A much earlier introduction for Leia in the film, as she receives a distress call from BB-8 about the Jakku village attack. 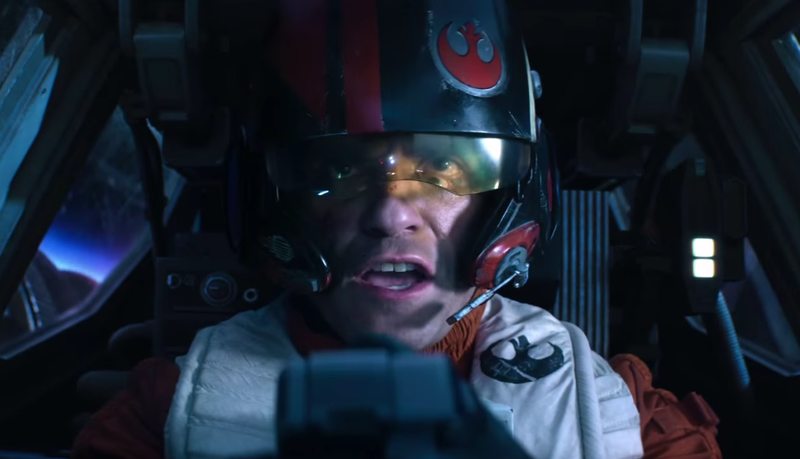 A scene called "X-Wings Prepare for Lightspeed", in which Poe Dameron leads his squadron to their attack on Starkiller Base. Rey and Finn engaging in a snowspeeder chase on Starkiler Base, in-between Han Solo's death and their duels with Kylo. Rey watching over Finn's wounded body as she gets an update from Dr. Kalonia (Downton Abbey star Harriet Walter), who we previously saw tending to Chewbacca earler in the film. Which scene are you looking forward to the most? Tell me in the comments or tweet to @SithObserver, and may the Force be with you all. 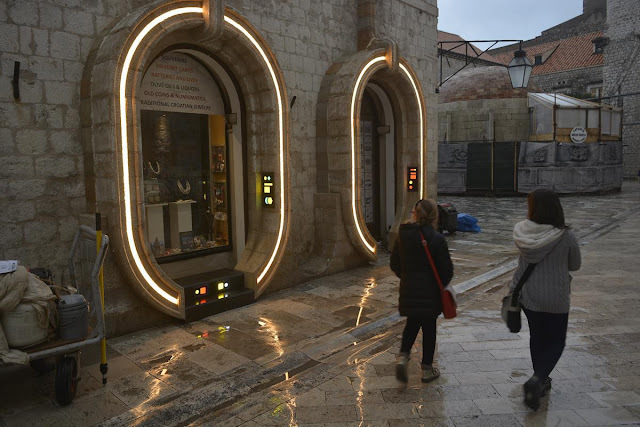 What's Happening on the 'Episode VIII' Dubrovnik Set? These neon lights and controlled panels were the first big signs that something special is happening in Dubrovnik. The city's architecture is most reminiscent of Naboo than any other place in the Star Wars universe, but if Episode VIII is like The Force Awakens, it'll stray away from the planets of the Prequels. 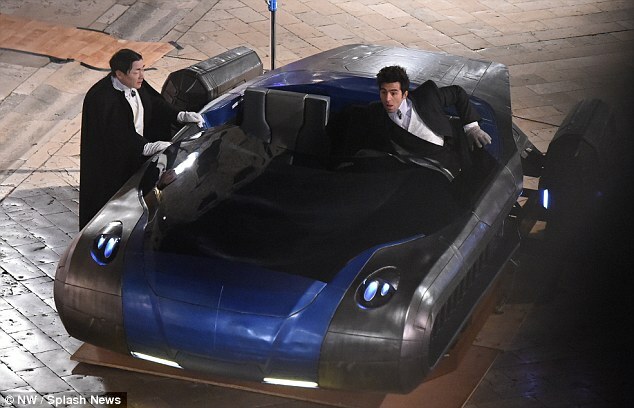 Regardless, if there's anything that the set photos tell us for sure, it's that this will be a pretty fancy place in the film...though that doesn't mean our beloved heroes won't find trouble. Here's some of the extras dressed like they're going to the opera, complete with suits, dresses, and scary alien masks. Even if this isn't Naboo, the textures and designs of this city are more similar to the glossy, clean tones of the Prequels (Coruscant, Kamino) than the rough, unforgiving terrains of the Original Trilogy and The Force Awakens (Tatooine, Hoth, Jakku). Rumor has it that in the context of the film, our heroes visit this planet to inform Lando Calrissian of his old friend Han Solo's death. This video isn't very clear, but you can see an unknown figure being thrown through the air. This indicates that they got hit by a small explosion, or (more excitingly) a Force push. The latter would confirm that Luke, Rey, and/or Kylo Ren are present in this city. Daisy Ridley stated that she wouldn't be filming in Dubrovnik, but it appears that her stunt double will be there to shoot some action scenes and Ridley will film the close-ups in identical sets at Pinewood Studios. 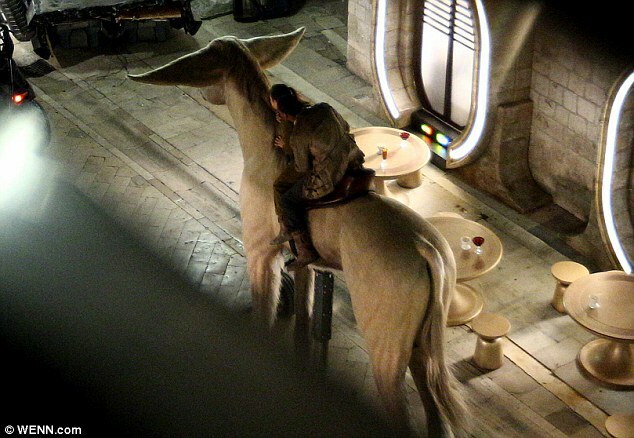 There's no doubt that one of the figures riding on the back of this beast is John Boyega (or rather, his stand-in since the actor himself was doing charity in London this week), but what about the other woman? 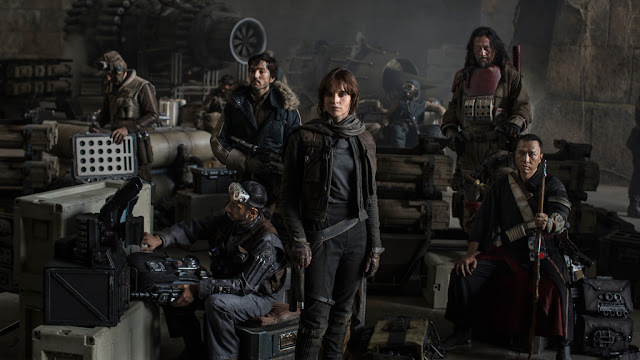 The obvious answer is Ridley's stunt double, but Making Star Wars reports that it's actually Kelly Marie Tran. Her character could be introduced as a guide of sorts who takes Finn through the city on this domesticated animal. What are your thoughts and theories about these photos? 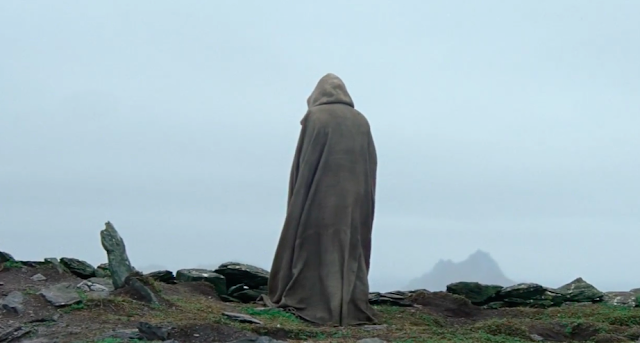 Where do you want Episode VIII to film next? Tell me in the comments or tweet to @sithobserver, and may the Force be with you. The footage shows a TIE fighter flying past AT-ATs, through the clouds, and towards the looming shape of the Death Star, before the title card runs. This closely resembles both the description of the footage and the leaked teaser from Celebration V, so we can assume that it's legit. The official teaser will be more exciting, showing us the film's protagonists, at least one type of cool new stormtrooper, and maybe even Darth Vader himself. 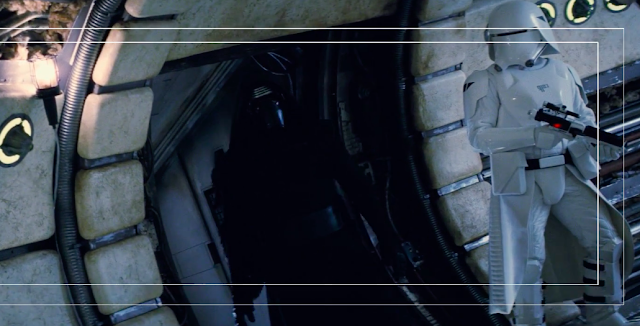 The text at the top of the video appears to be the name of the file, reading "ROGUE1_BvS_1_1.mxf." This would suggest that the first teaser trailer for Rogue One will be coming with Batman v Superman: Dawn of Justice (often abbreviated as "BvS") on March 25th. This makes sense, considering the recent reports that multiple finished trailers are currently making the rounds at Disney before release. What are you hoping for in the trailer? Tell me in the comments or tweet to @SithObserver, and may the Force be with you all. After watching The Force Awakens a dozen times in theaters, you were probably wondering when you could buy it on DVD and save it for a Rey-ny day. (Sorry for that pun.) Today it was announced that the film will be available on Digital HD on April 1st, and Blu-ray and DVD on April 5th. But most importantly, the trailer shows a glimpse of one of the deleted scenes that I discussed back in January: Kylo and several snowtroopers boarding the Millennium Falcon. The full extent of this scene will show Kylo sitting in the cockpit of his father's ship and having an emotional moment. 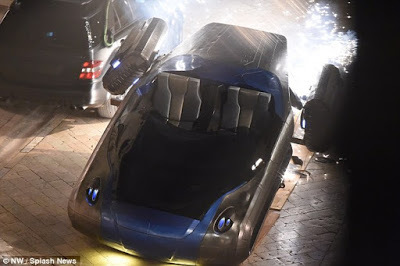 Along with the deleted scenes, the Blu-ray Combo Pack and DVD will come with a variety of bonus features, including lots of behind-the-scenes footage and exclusive interviews with the cast and filmmakers. Are you looking forward to watching The Force Awakens in your home? Tell me in the comments or tweet to @SithObserver, and may the Force be with you.